I harvested some veggies from my garden so I decided to build a Buddha Bowl for lunch. A Buddha Bowl is really anything you want it to be just follow these simple rules. Start with a grain like bulgur, rice or quinoa, top with your favourite veggie (and fruits like tomato and avocado) and finish with a spectacular sauce like my asian peanut sauce. Nuts are also a great crunchy addition. You can also make the bulgur in advance and keep it in the fridge. I used bulgar as it has more protein and fibre than brown rice. (18 net carbs in this dish) The nutritional yeast flakes also add more protein but don’t alter the flavour. Experiment with this dish and let us know how you do! Rinse bulgur in a strainer under cold water and set aside. Bring water to a boil, add bulgur. Cover and remove from heat and let stand for 20 min. Steam cauliflower and broccoli florets till al dente and let cool slightly. Vigorously mix garlic, sesame oil, lemon juice, tamari and peanut butter and set aside. In a large soup bowl layer 1/2 c bulgur (or more if you are famished) warm broccoli and cauliflower, swiss chard and tomatoes. 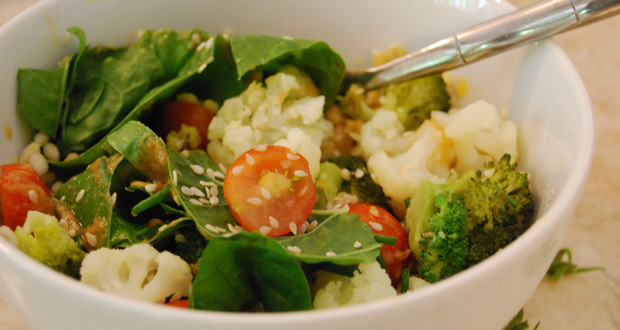 Liberally pour the dressing over the salad and top with snipped fresh chives and sesame seeds.